BioWare has announced Star Wars: The Old Republic's massive expansion Knights of the Fallen Empire, which promises more focus on story. Original Story: The announcement came from BioWare Austin General Manager Jeff Hickman Monday afternoon during EA's 2015 E3 conference. Twice, the promise of a "BioWare style story" was given. The expansion is focused on player choice - the path you choose, companions you turn into allies, and people you either join or betray all go into shaping the story. Knights of the Fallen Empire will offer new worlds with a heavy emphasis on a player-driven story. Story line was the focus of the trailer, which told the tale of twin brothers with an overbearing father, who grow into fierce warriors faced against each other. BioWare is calling the expansion the biggest to date, offering nine episodes with more coming month-by-month in the New Year. Knights of the Fallen Empire will be free to all current subscribers to the game when it releases on October 27. "In addition, with the launch of Knights of the Fallen Empire the original eight class stories from Star Wars: The Old Republic will be enhanced to deliver a more immersive and engaging single-player story arc for players old and new. Plus, end-game experiences in Star Wars: The Old Republic will be advanced, giving players the option to join with friends in a variety of multiplayer missions upgraded to Level 60+. As part of the announcement, BioWare is excited to unveil the "Knights of the Fallen Empire Rewards Program". Between now and October 19, Subscribers can earn a collectible set of rewards each month that includes the Companion Nico Okarr, Nico's Duster and Blasters set, and a Star Wars: Knights of the Old Republic-themed Swoop Bike. 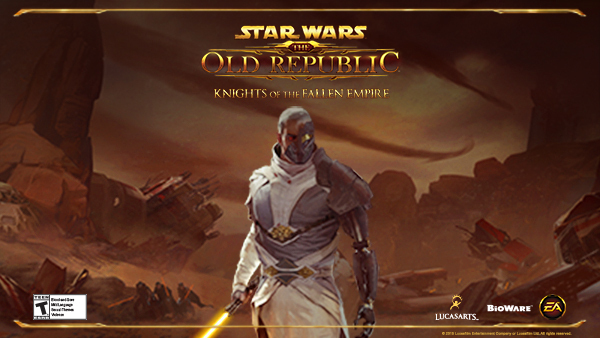 Players that collect all four rewards will receive as a bonus Early Access to Knights of the Fallen Empire beginning seven days prior to public release on October 20. For more information on the Rewards Program, visit: www.StarWarsTheOldRepublic.com/fallen-empire/rewards."